Much to our surprise the winds were blowing gently from the northwest at Cape May Point this morning, and monarch continued to move through Cape May Point in larger numbers than we expected. We saw monarchs coming into Cape May and others heading out across Delaware Bay en route to Delaware. There are still good numbers of monarchs at the Point, not just in the gardens but also moving along the beach and above the vegetated dunes. Female monarch at the Coral Ave. dune crossing. By midday the winds had shifted, blowing from the southwest, a direction that usually stops the migration temporarily. But the winds are still very gentle. We should know better than to predict what's going to happen next. Last night we predicted that monarch numbers would decline over the next few days, and that's still our best guess, but we were wrong about that this morning and we could certainly be wrong tomorrow and the next day. Whatever happens, we promise to report back regularly. When is the best time to visit to see a lot of monarchs? 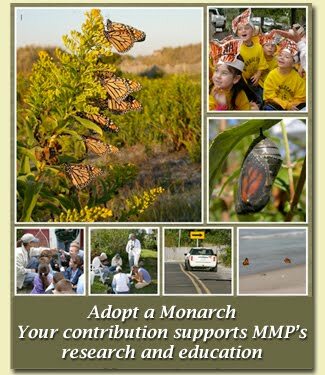 Most monarchs migrate through Cape May between about September 10 and October 20, but during that time period there are some days with lots of monarchs and some with only a few. There is no way to predict which will be the good days, but we will report promptly when we see a big increase in monarch numbers.